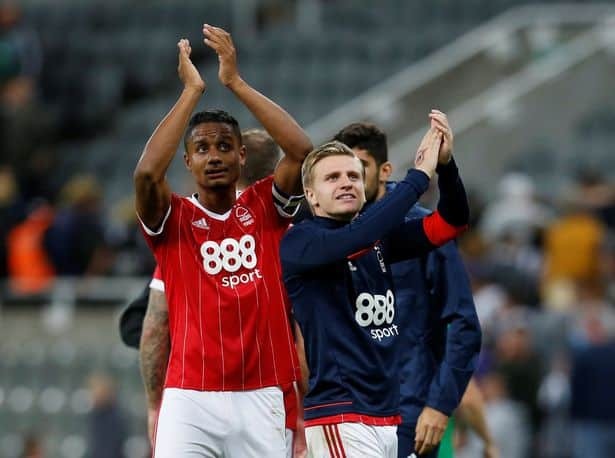 Nottingham Forest claimed a Premier League scalp in the EFL Cup, beating Newcastle United 3-2 at St James’ Park. Mark Warburton made a few changes to the team that beat Middlesbrough, playing a 4-3-3 formation with Jason Cummings, Kieran Dowell and Ben Brereton as a front three. Forest started badly after going 1-0 down to a sweet Aleksandar Mitrovic strike from inside the box into the top left corner of the goal, and had chances to go further ahead with Mo Diame lashing the ball over the bar. Forest began to get into the game with Ben Brereton forcing a couple of saves out of former Forest keeper Karl Darlow. Forest finally got their equaliser when Zach Clough chipped the ball up for Jason Cummings to head into the bottom right corner of the goal. Forest then took the lead just 2 minutes after when Jason Cummings chipped Karl Darlow from a looping ball that he connected sweetly with. Newcastle were determined not to go into the break behind and ensured they wouldn’t when Rolando Aarons hammered into the top left corner from 25 yards out to bring the tie level. Both sides had chances to take the lead in the second half, with Josh Murphy wasting a good opportunity putting his shot wide, he then had another chance but failed to capitalise on it after Joe Worrall lost possession and played the winger through. Matt Richie saw his beautiful curling shot go just wide of the mark, but Newcastle were lucky to get to extra time when they saw Jason Cummings’ well hit free kick hammer off of the crossbar which brought an end to the second half. Forest took the lead just seven minutes after the start of extra time when sub Tyler Walker headed in a ball that was flicked on by Jack Hobbs to put Forest 3-2 up. The away side then had to defend like soldiers when Newcastle threw everything they had at Forest, with Matt Ritchie missing chances and Mo Diame wasted a glorious chance when he headed over from inside the box. Forest were able to hold on and grab a brilliant away win to progress into the next round, where they will face Chelsea at Stamford Bridge. Unused Subs: Lascelles, Manquillo, Woodman. Nottingham Forest Team: Smith, Lichaj, Mancienne, Worrall, Fox, Osborn, Clough, Bouchalakis, Brereton, Cummings, Dowell.